Beverly Hills, CA - Dec. 14, 2017 – Moon Valley Nurseries has opened a VIP Concierge Design Center in the “Golden Triangle” shopping district at 9408 Brighton Way, Beverly Hills, CA 90210. Homeowners in the Beverly Hills area can utilize professional, top-notch concierge landscape design services from Moon Valley Nurseries, the nation’s largest box tree grower. Every step of the process is taken care of – from complete design to on-site layout, all carefully planned and catered to your needs by experienced, professional landscape designers. Our Moon Valley Nurseries in-house design team specializes in helping a diverse range of clients achieve their landscaping goals – including high-end clientele such as Hollywood celebrities to discerning Beverly Hills clientele desiring luxurious landscapes. Discerning homeowners that do not want to wait 20 to 25 years for trees to grow to a mature size know that they can count on Moon Valley Nurseries to create an instant landscape with the finest selection of premium-quality specimen trees, palms, and other plants that are custom-grown and ready to thrive in Southern California. About Moon Valley Nurseries: Moon Valley Nurseries opened its first nursery in a neighborhood north of downtown Phoenix, in an area known as “Moon Valley.” Since the beginning, Moon Valley Nursery has offered its “you buy it, and we plant it” tree deals. “We deliver and plant anything and everything in our massive inventory, and since we are the grower, we always guarantee to do it for the lowest price in town.” We believe our premium quality trees and plants along with our premium quality service is the perfect match for upscale Beverly Hills clientele. Moon Valley Nurseries Beverly Hills Design Center is open Mon-Sat 7 am - 6 pm and Sunday from 9 am – 5 pm. The People Have Spoken! Moon Valley Nurseries Voted Best Nursery in San Diego! Escondido, CA - Oct. 4, 2017 - The results are in and the readers of Ranch & Coast Magazine, San Diego’s Ultimate Lifestyle Magazine, have chosen Moon Valley Nurseries as the best nursery/garden store in San Diego! On the company’s continued growth and success, Moon Valley Nurseries founder and president Les Blake said, "Everything is value engineered, so not only are they grown from our selected mother trees in our labs, but they are also a tree that is guaranteed, always. We offer free planting and will bring the trees to your house and plant them for you. Our professional designers will help you design and plant your yard. We are excited to have been voted the best nursery in San Diego and look forward to offering the highest quality trees, plants, and service to our customers." Homeowners that do not want to wait 20 to 25 years for their trees to grow, know that they can count on Moon Valley Nurseries to create an instant landscape with the finest selection of specimen trees, palms, and other plants. Moon Valley Nurseries was voted best nursery in San Diego 2017 and looks forward to racking up more awards in California and beyond, and more importantly, making our customers’ landscaping dreams come true. About Moon Valley Nurseries: Moon Valley Nurseries opened its first nursery in a neighborhood north of downtown Phoenix, in an area known as “Moon Valley.” Since the beginning, Moon Valley Nursery has offered its “you buy it, we plant it” tree deals. “We deliver and plant anything and everything in our massive inventory, and since we are the grower, we always guarantee to do it for the lowest price in town.” Visit any of the nine retail locations throughout Southern California to see the difference for yourself. San Diego, CA – Jan. 30, 2017 – Moon Valley Nurseries, the largest specimen tree grower in the United States, is proud to offer free insurance quotes to all Lilac wildfire victims looking to rebuild their landscape and replace the trees and other plants that were lost or damaged from the fire. Having to replace everything can be difficult. During this stressful time, we want you to know that we are here for you. As a one-stop-shop, homeowners can have the peace of mind in knowing that we are going to get this done in one shot. For Lilac Fire victims, free professional landscape design consultations are available at your site. We offer complete professional removal of any foliage such as trees, shrubs, palms and other plants that burnt down. Fully licensed, bonded and insured. Moon Valley Nurseries has full-size trees and palms readily available to match the trees lost in the wildfire. We grow everything. Moon Valley Nurseries provides simple and pain-free services to get your landscape on the road to recovery. Don't be fooled by cheap trees! Beautiful silver green foliage with lacy arching branches combine to make a thick dense shade and are the perfect symbol of a Mediterranean escape. This is what makes the olive trees, (olea europea), so attractive to homeowners. Unfortunately, there is a disease that is threatening to ruin our beautiful trees and this disease has originated from the Central Valley region in California. Olive Quick Decline, as it is called, is quickly taking over the tree, causing branch die back and eventually the entire tree will parish. Olive Quick Decline has similar symptoms to leaf scorch from psyllids, (which is another issue in the Central Valley). Quick Olive Decline can be spread by insects, pruning, and other environmental factors. The easiest and best way to prevent the spread of this disease is to avoid buying Olive trees from the Central Valley region and purchase local Southern California grown trees from reputable sources such as Moon Valley Nurseries. Contractors and landscapers are purchasing these Central Valley Olive trees because they are able to get inferior trees, cheaply, and make a larger profit all while undercutting local growers. Don't be fooled by a low price on a cheap olive tree, you could be putting the rest of your landscape in danger by doing so. Moon Valley Nurseries has been growing trees for decades and has our very own Olive tree farm nestled in the beautiful Temecula wine country that is several hundred acres and growing! We grow all types of Olives from the fruiting Manzanillo and Mission Olive trees to Ancient Olives 100+ years old and the Fruitless Wilsonii Olive trees as well. All of our Olive trees are certified disease free and are guaranteed to stay that way for at least 2 years, no other company can say that! Moon Valley Nurseries has also been planting trees for decades and has a team of expertly trained professionals that will come to your home and get the job done right the first time. Big Tex Trees-Now one of the Largest Tree Growers in Texas! Moon Valley Nurseries and Big Tex Tree Nurseries proudly welcomes Glen Flora Farms to our family. Moon Valley Nurseries acquired Glen Flora Farms including over 200 acres of Texas' largest container grown trees. We're excited to be able to offer such high-quality trees to our customers! The entire staff of veteran, knowledgeable tree professionals is now joining the Big Tex Team! Glen Flora Farms has been growing specimen trees for over 36 years. This farm includes incredible specimens of up to 84-inch box size trees. Nearly all popular shade and native varieties are available in many sizes. Glen Flora Farms has been custom growing Texas favorites such as Cathedral Oak, Chinese Elm, Cypress, Japanese Maple, Chinese Pistache and more for over 36 years, and continues the tradition of growing only the highest quality trees available today. These amazing trees will be available through all Big Tex Tree Nurseries to all of our customers. Glen Flora Farms is located in Glen Flora, Texas, southwest of Houston. Visits to our new farm are welcomed by appointment Monday to Friday, call (979) 358-3328, to schedule an appointment. Residential or commercial jobs, homeowners, and contractors are all welcome! For your convenience, we have a landing pad for those who wish to fly in via helicopter. Please check back soon for more, including updated information regarding our giant growing farms and how this acquisition is going to benefit our customers. Tropical landscape shopping has never been easier! We call it Palm Paradise because of the thousands or rare palms we carry at this nursery from all over the world that have grown from hand selected seeds from our own specimen stock at our nursery. We guarantee that you have never seen a selection of rare palms like this before! Palm Paradise is helmed by Southern California native Jordan Scaparo, who is a third generation nursery grower. Jordan learned from his grandfather that if you loved the tree the tree will love you back. His grandfather opened up a nursery in New Jersey more than 85 years ago. Jordan's father helped at the nursery in New Jersey before he moved to Southern California in 1972. Finding that the selection of palms was limited, Jordan's father started growing his palms from seeds and when Jordan came of age he then opened up his own nursery called Woodland Nursery in 1999. This nursery was known throughout Southern California for their cultivation of palms that were nurtured from hand-selected seeds. Now in 2016, Jordan's family has joined the Moon Valley Nursery family bringing unbriadled knowledge and professionalism with them! A few of the rare palm varieties we carry are the Alexander Palm (native to Australia), Fishtail Palm (Asia), Archontophoenix maxima (Australia), Kentia Palm (Australia), King Palm, Pindo Palm (South America), Canary Date Palm (Canary Islands) , Chilean Wine Palm (South America), Cuban Royal (Caribbean), Triangle Palm (Africa), and more. All of the palms we feature at Palm Paradise have been grown in our local Southern California climate for decades, some have been growing since the 1800's! We even have some incredible specimens we've acquired or imported from tropical locations all over the globe. In addition to our palms, we carry the rarest Aloe trees in Southern California. These slow growing Aloe trees have been growing at Palm Paradise for decades and we guarantee you have never seen anything like them before. They look like a tree from a Dr. Suess book and you'll be amazed when you see them. They are truly one-of-a-kind. Palm Paradise is open to the public and in addition to our thousands of rare palm specimens we carry the biggest trees in the U.S. as well. Our new location at 26437 N. Centre City Pkwy now serves all of San Diego County including Rancho Santa Fe, La Jolla, Del Mar, Rancho Bernardo, Poway, San Diego, La Costa and more. We also deliver and plant in Orange County, Los Angeles, Riverside, and out of the state. Palm Paradise is located just off the I-15 at Mountain Meadow Road on North Centre City parkway. We are easy to get to from anywhere near or around San Diego County. Palm Paradise is led by general manager Jordan Scaparo and Justin Virabalin. Both of them and our nursery professionals are here to assist you in turning your landscape goals into a reality. We can not wait to help you at Palm Paradise! Worth the drive from anywhere in California! Inc. magazine ranked MOON VALLEY NURSERY, Inc. NO. 2950 on its 35th annual Inc. 5000, an exclusive ranking of the nation's fastest-growing private companies. The list represents the most comprehensive look at the most important segment of the economy—America’s independent entrepreneurs. Companies such as Intuit, Patagonia, Oracle, Under Armour, GoPro, and many other well-known names gained early exposure as members of the Inc. 5000. The 2016 Inc. 5000, unveiled online at Inc.com and with the top 500 companies featured in the September issue of Inc. (available on newsstands August 18 to September 22). The average company on the list have grown almost five-fold over the past 3 years. Complete results of the Inc. 5000, including company profiles and an interactive database that can be sorted by industry, region, and other criteria, can be found at http://www.inc.com/inc5000. The 2016 Inc. 5000 is ranked according to percentage revenue growth when comparing 2012 to 2015. To qualify, companies must have been founded and generating revenue by March 31, 2012. They had to be U.S.-based, privately held, for profit, and independent--not subsidiaries or divisions of other companies--as of December 31, 2015. (Since then, a number of companies on the list have gone public or been acquired.) The minimum revenue required for 2012 is $100,000; the minimum for 2015 is $2 million. As always, Inc. reserves the right to decline applicants for subjective reasons. Companies on the Inc. 500 are featured in Inc.'s September issue. They represent the top tier of the Inc. 5000, which can be found at http://www.inc.com/5000. Moon Valley Nurseries, America’s largest box tree grower, announces the grand opening of its new 35+ acre Irvine nursery. The nursery is located at 6501 Alton Parkway - visible from the 405 highway on the Northeast corner of the I-405 and Sand Canyon Avenue - This location is open daily Monday through Saturday from 7:00 a.m. to 6:00 p.m. and Sunday from 9:00 a.m. to 5:00 p.m.
“The amazing level of demand and the consistent phone calls asking for our quality trees and shrubs at the Irvine nursery has been non stop. We’re expecting this nursery to be even bigger than our San Diego nursery,” Moon Valley Nursery founder and president Les Blake said. “We deliver and plant anything and everything in our massive inventory and since we are the grower, we always guarantee to do it for the lowest price in town. Our Irvine nursery is one of our biggest nurseries and we’re very excited to offer the best quality trees and shrubs for all homeowners in the Orange County area.” Over 400 truckloads of trees have been brought in from Moon Valley Nurseries nearby farms and growing grounds just for the grand opening. The Irvine nursery marks the the ninth nursery Moon Valley Nurseries now operates in Southern California. Located just west or the Irvine Spectrum, this location will feature a massive inventory of shade, flowering, waterwise, fast growing, evergreen, and deciduous trees. All grown by Moon Valley Nurseries in all sizes from small to massive. In addition, practically every variety of palm that grows in Southern California is available. Nursery pros are always on hand for free design consultations for homeowners and businesses. Moon Valley’s other nurseries in Southern California are located in Fillmore, North Hollywood, Chino, Murrieta, San Diego, Riverside, Huntington Beach, and Coachella. In addition, Moon Valley has specialized in the wholesale market in Southern California for decades with over 1200 acres in production in numerous farms across Southern California. Moon Valley Nursery opened its first nursery in a neighborhood north of downtown Phoenix known as “Moon Valley”. Since the beginning, Moon Valley Nursery has offered its “you buy it, we plant it” tree deals, where the nursery staff performed everything from design thru installation. In addition to this, Moon Valley Nursery also grows its own trees and shrubs in order to maintain the highest level of quality that our customers had come to expect. The company operates 23 nurseries throughout Southern California, Arizona, Nevada, and Texas, along with 14 farms in Southern California. Tucked away in the serene hills between Temecula and Hemet, way off the beaten path in Southern California is where the story behind Moon Valley Nurseries amazing olive trees begins. Circa 1935, olives were widely grown in the area with hopes of providing fruit, olive oil and eventually trees for use in landscapes across the booming southern California real estate market. In the 60’s, Jim and Marian Shellaberger purchased the nearly 100 acre olive tree plantation with plans to simultaneously continue olive production while selling trees to area landscapers who were planting them across Southern California’s burgeoning housing market. Housing recessions in the 70’s and 80’s did put a damper on sales of the trees for landscape use, but Jim and Marian continued to maintain their now large olive tree plantation with the same love and nourishment as the day they started – even when most olive farms in the area were plowed under or abandoned. Since they had so many trees that were meticulously cared for and continued to flourish, the family decided to begin processing organic, craft olive oils from the fruits that still were abundant on the now 50+ year old trees on the property. Unfortunately, before the first oil was produced, Marian passed away after battling Ovarian Cancer and never got to taste the amazing olive oil that came from the farm. In her honor, Jim and his daughter named their product Marian’s Extra Virgin Olive Oil. For years, Marian’s EVOO as it was known was a favorite, found at many of the areas organic farmers markets, wineries and locally owned health food markets. In fact a portion of the proceeds from every bottle sold was donated to the Ovarian Cancer Research Fund. Fast forward to today and you’ll find that Jim and Marian’s legacy is thriving through the acres of amazing trees that still flourish on the property that they founded so many years ago. In fact over 50,000 trees are still growing and professionally cared for at this plantation. Jim and Marian’s original goal of providing environmentally sensible, low water use trees for landscapes also continues to this day. 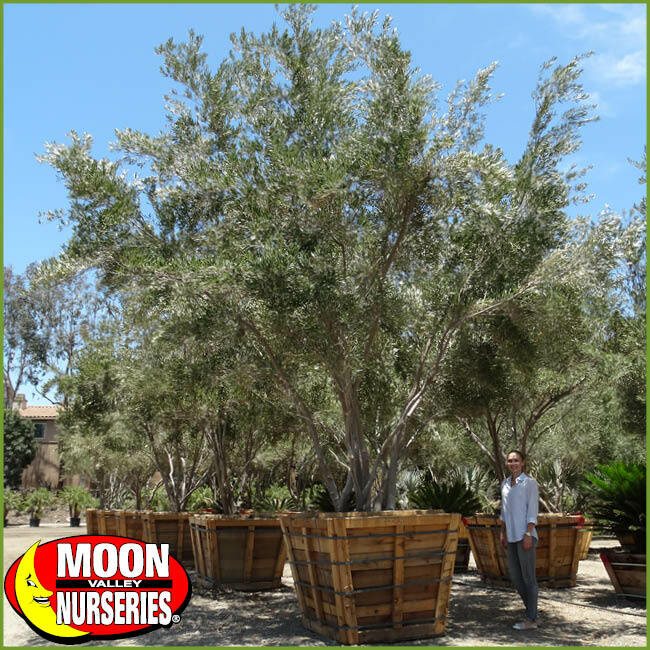 Moon Valley Nurseries recently acquired this grove of incredible olive trees and will continue to professionally harvest and plant these trees for home owners and business around the Western United States. These Olive trees have grown their entire lives in the hot and dry inland climate and make a far superior choice for landscape use when compared to olive trees from the central valley region – both for health and low water usage. In fact this grove of treasured olive trees has always been certified 100% organic for production of olive oil and has been completely disease free since its very beginning. When investing in an olive tree for your property, please consider the long term health of your tree and try to avoid purchasing from areas known to harbor potential fungal or soil borne diseases, particularly known on trees coming from the central valley region of California. Inferior trees from outside our region can not only bring you an unsightly, infected tree, it can also lead to possibly spreading pathogens among our incredibly healthy, local grown trees. Moon Valley Nurseries is honored to continue the loving tradition that Jim and Marian started at this truly unique property. Acres of Manzanillo and Mission olive trees continue to grow, now joined by fruitless Wilsoni Olives and many other low water use tree varieties. Jim and Marian’s original, decades old olive trees are now available for purchase at all Moon Valley Nursery locations across Southern California. In addition, the original farm continues to be maintained and new trees and plants are being grown there with the same attention to detail as when Jim and Marian originally planted the first olive tree there. Allow us to bring part of Jim and Marian’s amazing Southern California legacy into your landscape! Inc. magazine today ranked MOON VALLEY NURSERY, Inc. NO. 4200 on its 34th annual Inc. 5000, an exclusive ranking of the nation's fastest-growing private companies. The list represents the most comprehensive look at the most important segment of the economy—America’s independent entrepreneurs. Companies such as Yelp, Pandora, Timberland, Dell, Domino’s Pizza, LinkedIn, Zillow, and many other well-known names gained early exposure as members of the Inc. 5000. "It's incredible to be recognized with some of the fastest growing companies in America and really illustrates the dedication and innovation provided by all the team members at all levels here at Moon Valley Nurseries," said CEO and Owner Les Blake. About Moon Valley Nursery, Inc. Moon Valley Nursery, Inc. is a retail and wholesale tree and plant nursery that has been serving the Western United States for over thirty years. Since the beginning, we have operated as an Arizona based, family owned company and still do to this day. We are committed to growing and providing our customers with the highest quality and largest selection of trees and plants available while maintaining the absolute highest level of service. We are the largest box tree grower in the United States, growing over 1,500 varieties of trees, palms and shrubs which allows us to guarantee the lowest price anywhere. Whether you need just a tree or two, or an entire landscape, come see the Moon Valley difference for yourself. Bigger trees, better service and always the best price...Guaranteed. For more information visit http://www.moonvalleynurseries.com. The severe freeze of 2007 was the catalyst for creating Moon Valley Nurseries amazing tree and plant growth enhancer known now as Supercharged Moon Juice. When the record freeze event hit, Moon Valley Nurseries had acres and acres of destroyed trees, palms, plants and more. Losses were estimated at nearly $50 million considering present plus future inventory losses. With thousands of blackened trees that were pretty much left for dead, Moon Valley Nurseries was desperate and tried numerous nutrients to stimulate regrowth. Bacillus microbe treatments, Thiamine mononitrate (B-1), superthrive and most known stimulators were used with no success. Moon Valley Nurseries consulted with the legendary area botanist David Plant who suggested trying a new, experimental plant nutrient called Furst Liquid. This proprietary blend of selected amino acids and proteins immediately showed results. It was tested on a 5 acre portion of the freeze damaged trees and nearly all within the test were able to begin recovering and within a year or so had returned to near normal. Unfortunately, the other trees that weren’t given the Furst weren’t able to recover and had to be mulched. It was apparent that Furst liquid contained incredible properties for instigating and maintaining vigorous growth along with recovery benefits for all tree and plant varieties. Moon Valley Nurseries was so impressed with it, that Furst Liquid was immediately incorporated into a new type of liquid plant nutrient which is now known as Supercharged Moon Juice. Customers initially began using Supercharged Moon Juice primarily as a transplant enhancer to help ensure faster growth of new plants along with minimal transplant shock. It was soon found to benefit trees and plants during nearly all stressful situations including drought resistance, freeze damage recovery, heat stress or recovering from physical damage caused by wind or insects. Regular use of Supercharged Moon Juice helps trees and plants maintain an overall vigor and vibrancy that can’t be achieved with other fertilizers alone.